When you’re a new mom or expecting a baby one of the biggest hurdles is sleep. You don’t have to feel helpless forever because there are ways for getting your baby on a sleep routine. Hang on tight mama, sleep is on the horizon. Check out these tips to get the sleep rolling for you and your little one. #1. Wait until your baby is old enough. There is a good time for you to get your baby on a sleep routine. That first couple of weeks, your baby is figuring out life. They need you to hold, cuddle, and love them! Don’t get overly anxious about starting a sleep routine when they are newly born. #2. Prep the nursery with the right gear. When I was pregnant, it was super important that I had the right gear for my baby. I always researched the best gear to use with my babies. I also had several newbie parents recommend a few of their favorite baby gear. In doing research, I visited the Women’s Choice Award website and saw that Sealy Baby had earned the Women’s Choice Award consistently since 2013. They’re highly recommended by 9 out of 10 of their customers as well as moms across America. So if you’re planning your nursery, make sure you add Sealy Baby’s mattress and bedding to your list. The Sealy Select 2-Cool 2-Stage Crib Mattress and the Sealy Stain Defense Crib Mattress Pad are both products a new mom needs to have in the nursery. The Sealy Stain Defense Crib Mattress Pad is great for protecting your crib mattress from potential blowouts. It has stain repellent and releases technology to help keep stains off the mattress. Plus, this crib mattress pad is hypoallergenic and will keep your crib mattress like-new for many years. The Sealy Select 2-Cool 2-Stage Crib Mattress offers everything you could possibly want in a crib mattress. It offers your baby the firmness of an ultra-sturdy and lightweight polyethylene core with a Cool-Tex waterproof and stain-resistant fabric cover that resists bacterial and fungal growths and many viruses for luxury and comfort. Flip sides when your baby becomes a toddler for the cooling comfort of soybean cool gel. The square corners help enable the mattress for a snug fit for most standard cribs and toddler beds. #3. Take care of yourself, mama. In the route to get your baby on a sleep routine, take care of yourself. This includes going to bed at a decent time. I know it can be so hard to want to go to bed, however, it is essential. Getting your rest will help you be a better mom in the long run. #4. Start to establish a routine early. Your baby doesn’t have to be a great sleeper for you to start a sleep routine with them. Reading a book, cuddling, taking a warm bath are all great ways to lullaby your baby to sleep. You can start this routine when they are first born up until they don’t like it anymore. Spending that extra quality time with your baby will never be something you regret. #5. Take a break when you need it. Getting a baby on a sleep routine can make you feel bonkers. That is why taking turns with your spouse is a good idea. 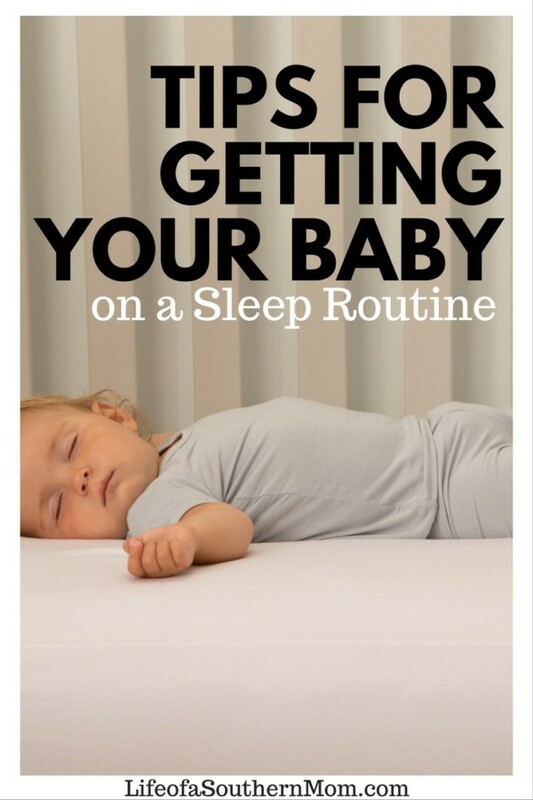 Let your baby get used to both of you during the night time sleep routine. This is a great idea, just in case one of you need to be absent during an evening. What tips would you add? Have you had any luck with getting your baby into a good sleep routine? Now that I have shared some awesome tips for getting your baby on a sleep routine I would like to share some exciting news. Life of a Southern Mom is super excited to have teamed up with Sealy Baby to offer my readers one fabulous giveaway for expecting moms, and moms. I will be giving away a Sealy Select 2-Cool 2-Stage Crib Mattress and the Sealy Stain Defense Crib Mattress Pad to one lucky reader. Read the details below for more on how you can enter to win. By entering you agree to abide by the Terms and Conditions listed below and on the Entry Form. The winner(s) drawn randomly using Random.org, and all winning entries will be verified. The winner will receive an email from Jennifer at lifeofasouthernmom@gmail.com and will have 48 hours to claim prize or a new winner will be chosen. Limit one entry per household and is open Worldwide to residents 18 years of age or older. Void where prohibited by law. The sponsor is responsible for prize fulfillment. The odds of winning are based on a number of entries received and completed correctly. Disclosure: Life of a Southern Mom was given a free sample or compensation in exchange for this posting. All opinions are my own and may differ. I only recommend products that I would use for my family. Previous post: BabySmile Nasal Aspirator Giveaway! My husband and I share the duties as much as possible with the kids. We both shared in the rocking and giving the baby the last bottle before bedtime.